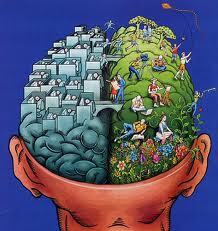 The left hemisphere controls the right side of the body, right side controls the left side of the body. You do this all the time, both parts – not either or. In software testing neither exploration and sequences can be split – the are a part of the whole of software testing. This is illustrated in Rapid Software Testing (PDF) pages 59-66, where the arrows (scripts) and cycles (exploration) take part within each other. Some people are good at using the left part of the brain, others using the right. Some have good working memory, others have good long term memory. People with asperger, have good working memory in context. Developing strategies to assist your working memory can a good thing for anyone, even if you have excellent working memory, but there’s no one solution that works for everyone: Some like scripts, some hate them.